This awesome cat is KC and he can live in any size home, including apartments. KC is twelve years young and he would love to live with kids of any age! 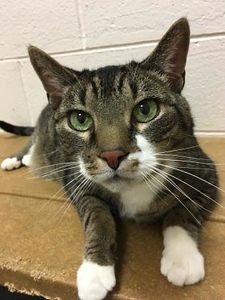 This kitty has not had much experience with cats or dogs but he may be willing to consider sharing his home with a furry friend. KC is declawed (front) so for his safety, he must be an indoor only kitty. He is a quiet and reserved kitty and he would like a quiet place to nap in a loving, peaceful home.